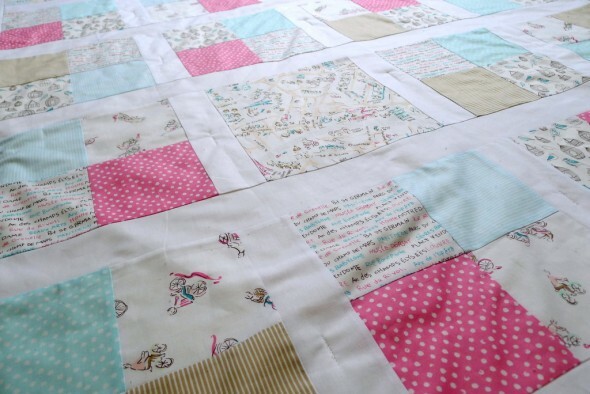 I worked on this quilt so quickly that I haven’t even done any other posts on it. I finished this a couple of weeks ago for one of Adam’s coworkers, whose baby girl was just born 3 months premature. I thought she could use something for those days and nights in the NICU. I’m really pleased with it, I wasn’t sure how all the white sashing next to white backgrounds would look. I think it’s actually pretty cheery, but a little hard to take quick photos of. The fabric is the J’adore Stella line from Dear Stella fabrics. I wanted something baby girly but not teddy bears and princesses. I just made some 4 patch blocks with each of the 4 patches cut to 5″ square, so they came to about 9.5″ square for each finished block. And I used the map print from the line to cut out some single 9.5″ squares to break up the 4 patches a little bit. I used some Kona Snow jelly roll strips that I already had. I pieced the back improvisationally using the word print yardage and the scraps I had left and actually sewed the label into the back, which I’ve never tried before. It actually inspired me to order some more labels from Spoonflower, but much bigger than my current ones. It’s hard to piece in those small labels. Because I was trying to work on this one quickly, I didn’t make a quilt sandwich with binding. 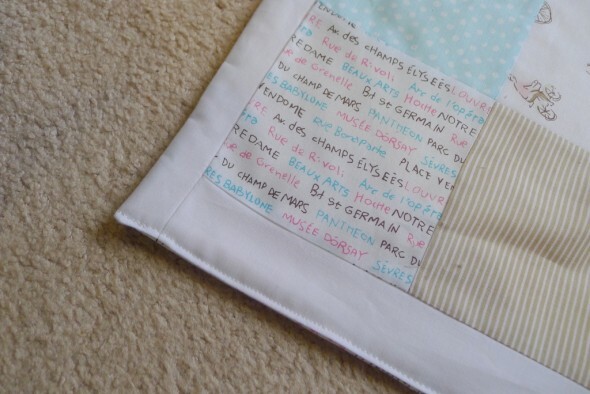 I did everything right sides together so I could turn it inside out like the “Super Quick + Easy Baby Quilt” I love to make from Last-Minute Patchwork + Quilted Gifts. And I just stitched the whole bottom side closed like I like, rather than blindstitching it. 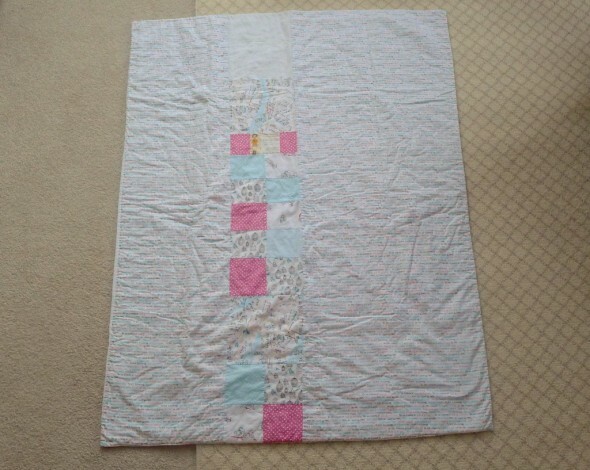 I just did stitched ties throughout the quilt for the quilting, so this is very light and breezy. 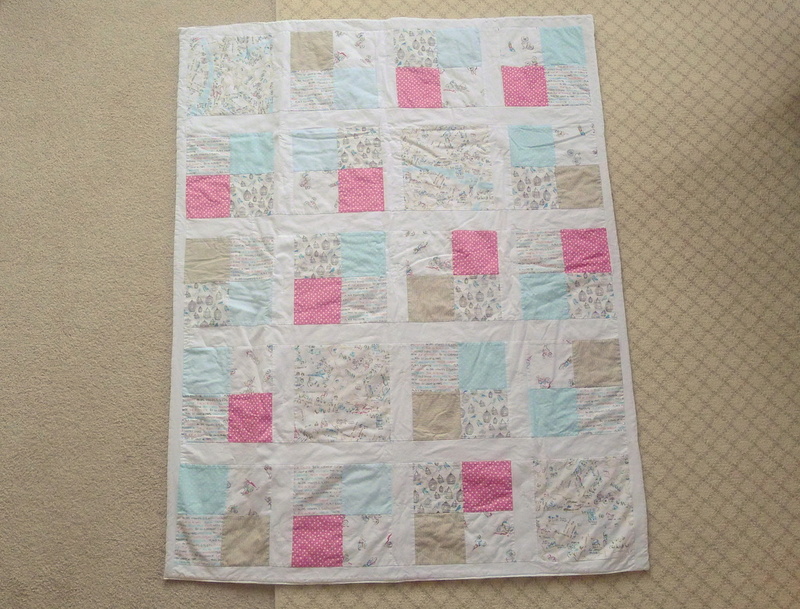 Finished it’s about 45″ x 60″, a nice big generous baby quilt/lap quilt size. I hope it loves its new home!